One of only two known surviving examples. Pictured p. 177, Painted Ponies, from the Orre Collection. Charles Dare was the first manufacturer of portable carousels. Originally in New York City and later in Brooklyn, Dare's horses closely resembled Armitage Herschell horses and were relatively small. Dare also produced a variety of menagerie figures. 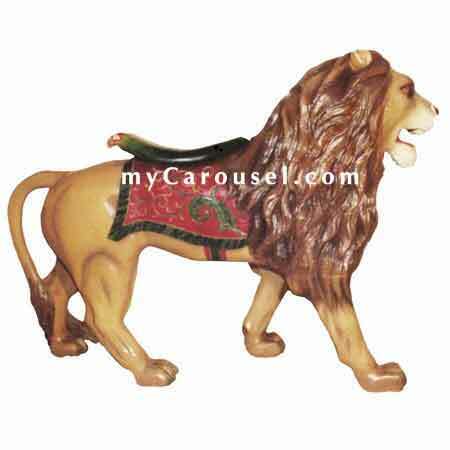 Although realistically rendered, this large lion retains the folk art charm of Dare's other carvings. Beautifully restored, double parrot back cantle, full mane, 67" long x 46" high.